Not The Barnet Times: How low can you get? It is bad enough that greedy MPs have dishonoured Parliament and defrauded their constituents with their rampant snout-in-the-troughism, but their list of excuses simply insults our intelligence. If every MP who says “it was within the rules” had to pay a fiver to the Treasury, the National Debt could be paid off within a week. The odious Labour MP Elliot Morley claims that it was just due to “sloppy accounting” that he hadn’t noticed the mortgage he was still claiming interest payments for had actually been paid off. One payment perhaps, but this went on for 18 months. But nauseating LibDem MP Lemsip Opik has used the tragic death of his brother as an excuse for claiming back the cost of a summons for non payment of council tax. In an interview to the BBC, Opik said that when his brother died in November 2005, his council tax bill was not “the highest thing on my mind.” No one would expect it to be, but that doesn’t mean the taxpayer should have to pay your fine. If a company executive drives to a customer on business and gets a parking ticket or a speeding fine, should his/her employer pay the bill? No, of course not. If we make a mistake - even if there is a good excuse - we suffer the consequences ourselves. That’s what happens in the real world. May Mr Opik’s brother rest in peace. Hopefully he never knew what a sleazeball his brother turned out to be. The shameful thing about all this is that many of those who are now saying sorry are apologising for being caught rather than apologising for what they actually did. The green book on mp's expenses is quite clear about what is acceptable. 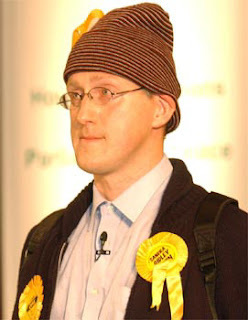 Lembit has no excuse. I commend you for not trying to make excuses for a fellow LibDem. There are still honourable politicians in all the main parties and it is now time for them to step up to the plate and lead us out of this mess. The need for strong leadership is greater than ever before if we are to avoid the descent into anarchy.